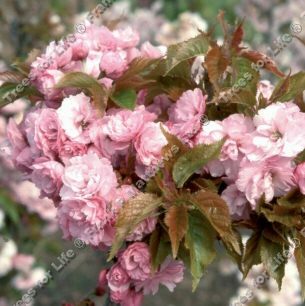 Candy Floss (Prunus - Matsumae-beni-murasaki') is distinguished by its very large, deep-pink flowers, which have attractive fringed petals. As these flowers age they somewhat resemble to texture of crushed velvet. Beautiful coppery-bronze leaves make a lovely contrast to the flowers. A Matsumae cherry. Candy Floss is supplied at a height of between 1.5 and 2.2 metres in a 12 litre container for year round planting and better results than from either bare-root or rootballed stock.